Ethnic Crimean tartar children play on a cell phone in candlelight at their home, after a power failure, in a village outside Simferopol, Crimea, Sunday, Nov. 22, 2015. Complete darkness descended on Crimea on November 21 after Ukrainian activists blew up transmission pylons connecting the region with Ukraine, from where power supplies come. The power blockade has forced the two million residents of Crimea to cope without light. A group of Ukrainian and Crimean Tatar activists opposed to Russian rule in Crimea blew up pylons in Ukraine’s Kherson Region late on November 21. The pylons carried power lines to the disputed Crimean peninsula. Despite being administered by Russia since March 2014, Crimea has continued to receive electric power from the Ukraine grid. 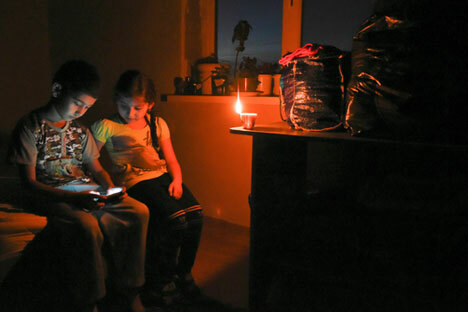 As a result of the incident, the peninsula was plunged into darkness, and most of the region’s two million residents are without electricity. While federal and regional Russian authorities have been readying themselves for Crimea's likely disconnection from Ukrainian power lines since last year, the peninsula was unprepared for the sudden and complete severing of electricity supplies from Ukraine. Earlier, Crimea got 80 percent of its energy from Ukrainian nuclear power plants, and generated only 20 percent at its thermal, solar and wind power stations. So how is the peninsula coping with life without electricity? Local authorities have installed autonomous sources of power at the most important social facilities; maternity homes, hospitals, blood transfusion stations, children's homes and nursing homes. Thirteen powerful mobile gas turbine power plants and more than 1,000 diesel generators have been brought in from Russia. This has increased Crimea's own generation to 35-40 percent of its requirements, or 350 MW. Crimea normally draws around 850 MW and 1,200 MW at night during the autumn and winter period. The trolleybus service, which operates on power drawn from overhead lines, has been shut down – in Crimea, this type of transport operates not only in the cities, but also connects the Crimean capital of Simferopol to the resorts on the Black Sea coast – Yalta and Alushta. Trolleybuses have been temporarily replaced with buses. To save energy, street lighting has been turned off. Boilers have been stopped, since it is around +15C outside for the second week in a row, but at the same time the centralized water and gas supply has been maintained. Meanwhile, the supply of electricity to Crimeans' homes has been rationed. For example, in Sevastopol, home to more than 400,000 people, the residents are getting two or three hours' supply, followed by a six-hour cut, after which the cycle begins again. Many manufacturing facilities have had to suspend production due to the lack of power; they are now suffering heavy losses and still do not know how to cover their shortfalls. Other companies have decided to invest in the purchase of diesel generators. The city continues to bake bread, make preserves and wine. Shipyards continue to fulfill orders. Most of the chain stores and gas stations, which stockpiled generators during the blackouts of last year, are operating. There are enough food and fuel – they are being delivered from the Russian mainland via the Kerch Strait. Smaller shops have moved working hours to the daytime, occasionally trading in the evening by candlelight, while city cafes have begun to lure visitors with notices – "Come in, we have light." "In our neighborhood, only one of the five grocery stores is open. In the evenings, there is a queue there, and you cannot always buy bread. We have stopped buying dairy products, because we doubt that they've been always kept at the right temperature," said Nadezhda Ryabko from Simferopol. In most cities, holidays have been declared in schools and kindergartens. In Sevastopol, the schools are open, but children are beginning classes later, when it becomes light outside. In addition, Crimea has started having problems with cellphone access and the internet. It is difficult to get through and conversations are often interrupted. There has been no communication with some cities for several days. In Sevastopol, the batteries at mobile network stations are additionally fueled by mobile diesel generators to avoid rapid wear, and the situation with communication has stabilized there. Crimea’s villages have been hit the hardest by the blackout. There has been no electricity since Nov. 22, and many are not supplied with gas. Field kitchens have been sent to the region’s villages by order of the Emergencies Ministry to feed people hot meals, and diesel generators will start to be delivered in the coming days. Despite the hardships, the blackout has also brought many Crimeans together. In the evening, the streets of Crimean towns are unusually crowded. Residents go out for a walk, so as not to sit at home in the dark, drop by cafes. "Before in the evening, we would all sit at home on the internet or watch television, and now we come together at a table, playing board games, talking," said Yevgenia Yurkova from Sevastopol. When will there be light? The Crimean authorities have called the destruction of power lines by Ukrainian activists an act of terrorism directed against civilians. Crimean Prosecutor Natalya Poklonskaya has opened a criminal case against the organizers of the attack on the power lines, on charges of sabotage. The Ukrainian state-owned energy firm Ukrenergo considers the situation as force majeure. This gives it the right not to pay fines for the lack of electricity supply to Crimea. "You can be sure that all of the losses will be taken into account. Calculations are already being performed by Russian specialists," said the governor of Sevastopol, Sergei Menyailo. Damage from the destroyed power lines is estimated at 1.9 million rubles ($29,000). Ukrenergo has postponed the repair of the power lines several times already. But many residents of the peninsula are pinning their hopes on an "energy bridge" across the Kerch Strait that will connect the peninsula with Russia's power system. Russian Energy Minister Alexander Novak has said that the “energy bridge” will be delivered earlier than planned, and the first phase, with a power flow of 350 MW, will be launched on Dec. 22, 2015. The second stage will be delivered in the summer of 2016, after the "energy bridge" reaches its total capacity of 850 MW. In 2017-2018, two new power plants with a power capacity of 470 MW each will be built, after which Crimea will achieve full energy independence.